My girls complained of being “bored” again yesterday so I hopped on the internet and searched for science activities for them to do. 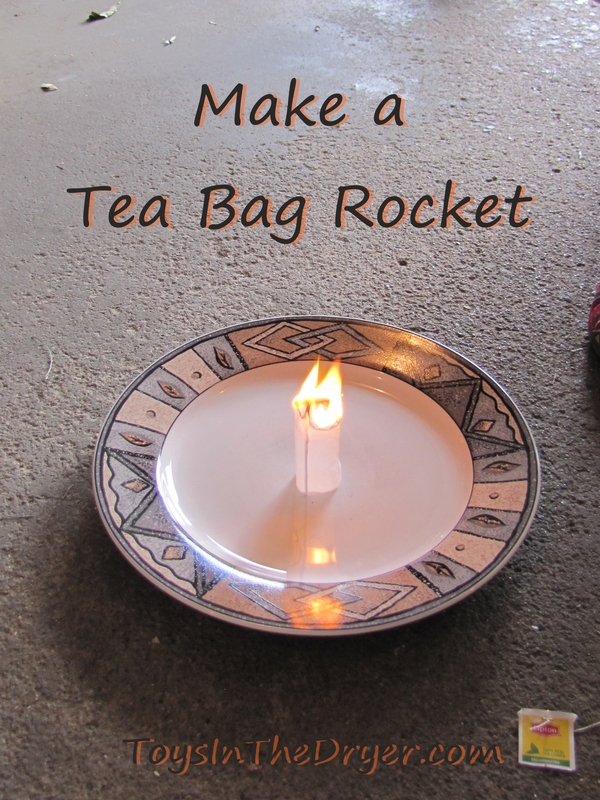 I came across this tea bag rocket on Kids Activities Blog and thought my girls would love it. Turns out they did! Our first rocket didn’t work. I’m not sure why. It simply burnt down without lifting up. The girls were disappointed but as you can tell from the video, our second one went just fine! We went through 6 more tea bags before I told them I was done. I don’t like to steal other blogger’s ideas so you’ll have to go to Kids Activities Blog for the actual directions and to see why this awesome rocket works. One final note, Kim did her rockets inside her house because she said any type of breeze outside will knock the rocket over. I was too scared of flying fire in my house so we did ours in the garage. Turns out, if you have a high ceiling, you can totally do this inside as the rocket burns itself out super fast.